In this concise and powerful book, one of the world's leading historians of the Enlightenment provides a bracing and clarifying new interpretation of this watershed period. 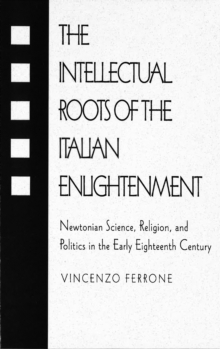 Arguing that philosophical and historical interpretations of the era have long been hopelessly confused, Vincenzo Ferrone makes the case that it is only by separating these views and taking an approach grounded in social and cultural history that we can begin to grasp what the Enlightenment was--and why it is still relevant today. 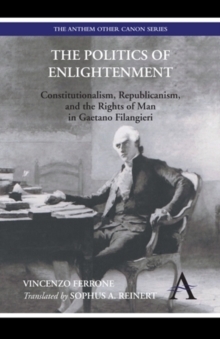 Ferrone explains why the Enlightenment was a profound and wide-ranging cultural revolution that reshaped Western identity, reformed politics through the invention of human rights, and redefined knowledge by creating a critical culture. These new ways of thinking gave birth to new values that spread throughout society and changed how everyday life was lived and understood. 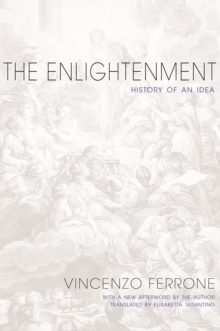 Featuring an illuminating afterword describing how his argument challenges the work of Anglophone interpreters including Jonathan Israel, The Enlightenment provides a fascinating reevaluation of the true nature and legacy of one of the most important and contested periods in Western history. The translation of this work has been funded by SEPS--Segretariato Europeo per le Pubblicazioni Scientifiche.